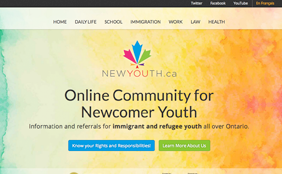 NewYouth.ca was created in 2008, with funding from Immigration, Refugees and Citizenship Canada (IRCC), in response to focus groups held by OCASI that newcomer youth were not accessing direct settlement services. The aim of the site has been to bring settlement information directly to young newcomers using a variety of channels. NewYouth.ca enhances the accessibility of settlement services for newcomer youth by utilizing content that is written in clear and appropriate language, multimedia technology and online social media tools. It also provides youth with a venue to ask questions and receive accurate information and referral online from qualified peers and professionals. As with all social service users, it is often best to approach audiences where they are already choosing to congregate and where they feel comfortable. Youth in immigrant and refugee communities are highly comfortable with internet communications technologies. For this reason, a more concentrated effort was made to utilize online social media tools to connect with newcomer youth. NewYouth.ca can be found on Facebook, Twitter (@newcomeryouth) and YouTube (newcomeryouth). A bi-monthly newsletter is also available on the site. This newsletter gives newcomer youth and service providers working with newcomer youth an opportunity to share some of their challenges and success stories while keeping informed about the latest news and issues affecting new youth in Ontario.